10 x 10 Truss components are constructed of square, triangular, or flat pieces. All of our truss structures are designed for ease of assembly and available in a number of designs and sizes. Our truss systems are constructed of durable, high-strength aluminum and steel for supporting LCD or plasma screens, graphics, lights and other accessories. This 10 x 10 four chord exhibit display booth has an open front with a beautiful arch which is the perfect spot for a large sign or banner. The exhibit booth features two side trusses that leave room for other signs or displays and allow people into the trade show booth easily. Remember, you can contact a representative at any time to discuss a custom truss design that would work for your individual needs! This 3 chord truss system has the same components as the 4 chord trade show truss structure except it features a 3 chord truss profile rather than a 4 chord. 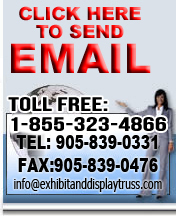 For those of you who have come to Exhibit and Display Truss and would would like some more information on trade show exhibits, you may want to visit our beginners trussing guide - What is a trade show exhibit display booth? 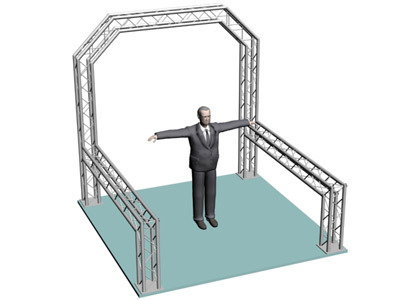 You can customize your truss and exhibit displays by adding truss components and pieces to suit your needs. Take a look at our 12 inch exhibit and display truss components.